What the Heck is a Pre-poo? When I first became conscious of my natural hair journey in August of 2011, I was surprised to find that there was a whole world of women out there who were wearing their hair natural, too. Not only were there tons of hair tutorial videos on Youtube, websites, and articles dedicated to this subject, there was also a natural hair care language. I would come across some websites like Hairlista and wonder what the heck they were talking about. One word that stuck out and annoyed me to no end was the word “pre-poo.” “What the heck is a pre-poo,” I’d often ask myself, scratching my head. Eventually, I realized that a pre-poo or pre-shampoo is simply a way to prepare your hair before you shampoo it. Initially, a pre-poo seemed like a lot of work to me. What was the point? I’m glad I asked that question because I soon realized that the pre-poo served a major purpose, especially in regards to African-American textured hair. The major reason many women love to pre-poo is due to the fact that many of us use shampoos that contain sulfates which strip our hair of its natural oils. Sodium lauryl, sodium laureth, ammonium lauryl, and ammonium laureth sulfates are surfactants that are added to shampoos and conditioners to cleanse our hair. Think of surfactants in the same way as detergents. They get our hair clean, but leave us with dry and brittle hair. If you currently use shampoo and conditioners that contain sulfates (simply check the list of ingredients) and have dry or brittle hair, you should really consider a pre-poo. In essence, the pre-shampoo helps our hair to maintain a lot of the oils that we would normally lose during the shampoo and conditioning process. Even if you use a shampoo that doesn’t contain sulfates, I highly recommend that you pre-poo for several reasons. The first reason is it will help your hair maintain its moisture balance to prevent breakage and encourage elasticity. Plus, it will make it easier to manage your hair on a day to day basis. I also find that pre-shampooing is fun. 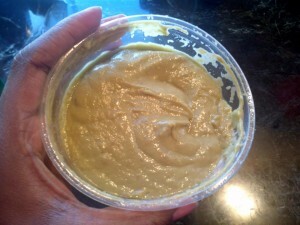 I have fallen in love with the pre-poo so much that I make my own. I feel like I’m loving on my hair when I do. You should note that a pre-poo can be as elaborate or as simple as you want it to be—after all, it’s YOUR hair! A pre-poo can be a hot oil treatment where you simply section your hair and apply the oil to your ends and then work it into the rest of your hair before placing a plastic cap over your head. Placing the plastic cap over your head for 15 minutes or more allows the oils to penetrate your hair with the added moisture created by the plastic cap and your own body heat. Afterwards, simply shampoo and condition your hair as normal. Trust me, you will feel a major difference when you shampoo your hair directly after a pre-poo. Your fingers will glide through your hair a lot easier than normal. A pre-poo also helps with detangling for many women which is a plus! Now, my idea of a pre-poo may seem like a bit much to some, but I love it. 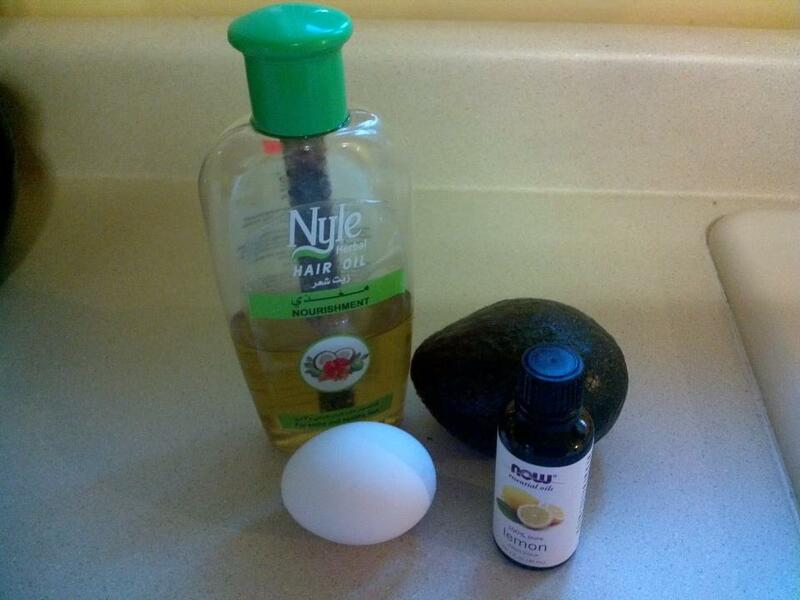 One of my favorite pre-poo recipes is the avocado pre-poo. OMG! I love, love, love it! To make it, you’ll need an egg yolk, an avocado, and 1 tablespoon of your FAVORITE oil. I have used Jamaican Black Castor Oil and extra virgin coconut oil in the past, but recently I used an Indian oil called Nyle and I loved it! I also added in some lemon oil to give it some fragrance. That’s it! That’s how you make it! Your pre-poo should look something like this. I just love that green color. Get a towel and place it around your neck. You may want to make sure it covers the front of you, too! It can get messy. When done, place a plastic cap over your head and let it sit for as long as you wish. Some women let it sit while they clean up or make dinner. Some people only let it sit for 15 minutes while others let it sit overnight at times. Do you because it’s up to you. Shampoo the pre-poo put and proceed to condition it! That’s all a pre-poo is in a nutshell. Even if you don’t use shampoos with harsh sulfates like sodium lauryl, sodium laureth, ammonium lauryl, and ammonium laureth, I still think you should consider pre-pooing your hair. Your hair will love you for it! If you need help in your healthy hair journey, please sign up for my FREE Healthy Hair Boot Camp! You will receive a healthy hair starter kit when you sign up! You’ll gain instant access to training calls, videos, and other resources to help you in your healthy hair journey. S I G N U P H E R E! How do natural haired sistas pre-poo their hair while they’re wearing a weave? If the article or video covers that, I am unable to see it at the momnet because a lot of sites are blocked at my installation. Cylenia MiAsia Harvey– you pre-poo before you put the weave in and shampoo your hair. Im about to start pre poo-ing! Thanks for the advice. Stacey SkincareSpecialist Allen pre-pooing is the bomb!!! Thanks for the article. Now I can pre-poo too My hair recently broke off and I couldn’t understand why. Then the hot water tank had to be replaced. . . full of rust. Problem solved, and hair is back on the mend. Any suggestions for me? Melinda Aldridge pre-poo, no shampoos with sulfates and deep condition weekly. How are u getting that look without flat irons??! Prepoo, sulfate free shampoo, deep condition, leave in with moisturize and seal, rollerset, then blow dry with round brush. This will get it bone straight. You avoid heat damage with the prepoo, leave in and moisturize and seal.